About Hotel: 1-Story, Exterior Corridors, single rooms, double rooms, and two-bedroom family rooms as well as more reasonable rooms their lodge, sleeping from one to six people. The motel offers cable TV, air conditioning, free ice, and complimentary coffee and donuts. Rollaway beds and cribs are here for your convenience. Non-smoking rooms are also available. Pool. Railroad View: Excellent. The view from this 1-story motel looks across a 2-lane road, some older trees are in front of the motel, but they are tall and spread apart which keeps a good view. Railroads past Hotel: Norfolk Southern / Amtrak. About 60 trains a day operate over this busy rail line. Most are freight. The Amtrak's pass Sandusky over night. A railroad grade crossing across from the hotel will give you notice of an approaching train, and may keep light sleepers awake. Comments: Motel not yet rated by RailfanMotels.com. Most guests that have left feedback on travel web sites gave this motel high ratings, though many did note the train horns that blow past this motel several times per hour. Photo Comments: Aerial view shows the motel surrounded by farms. 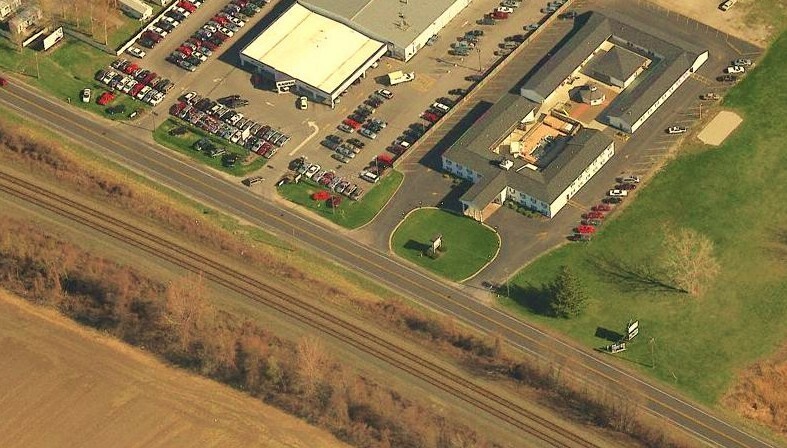 The double track railroad is just across US-6 from the motel. Right photo: Standing on the south side of the tracks, the Maples Motel can be seen on the north side of the tracks. Location/ Directions: Rt.2 (exit-Rt. 4) or Ohio turnpike (exit #110), Left on Rt. 4 / Hayes Ave., North to Sandusky, Right on Perkins Ave (BP station on corner), Take Perkins Ave until dead ends over railroad tracks, Turn left on Cleveland Rd. (Rt. 6), Melrose Motel is 1 mile on the right. About Hotel: 1-Story, 8-Rooms, Exterior Corridors, Each room is nicely appointed with 2 double beds, free wireless internet access, cable TV and DVD players, and individually controlled air conditioning. All rooms are non-smoking, however outdoor smoking is provided, Office Provides Beverages for Purchase, Complimentary Coffee, Microwave and DVD's. Credit card required to guarantee rooms, 3 day cancellation notice, No shows & cancellations made within the 3 days: will be charged 1st night lodging on credit card and balance of the reservation will be canceled, Major credit cards accepted: MasterCard - Visa – Discover. Open from Memorial Day to Labor Day. Railroad View: Good. 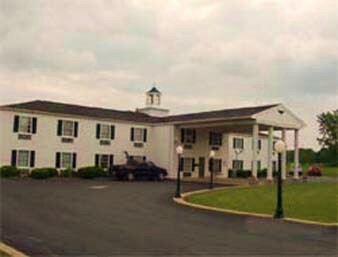 The view from this 1-story motel looks across a 2-lane road (US-6). Along the railroad tracks there are some trees and brush, but the railroad is on a high roadbed which keeps the trains above most of the brush for a good view. Railroads past Hotel: Norfolk Southern / Amtrak. About 60 trains a day operate over this busy rail line. Most are freight. The Amtrak's pass Sandusky over night. Photo Comments: The only thing that fouls part of the view is some trees and brush along the railroad. Motel is only open during the summer. Location/ Directions: State Route 2 to Rye Beach exit. At bottom of exit ramp, turn left onto State Route 6. Proceed 4 miles, hotel is on the right. About Hotel: 2-Stories, 64-Rooms, Interior / Exterior Corridors, Free Continental Breakfast, High Speed Internet, Seasonal Heated Outdoor Pool and Spa, Hair dryers, 25 inch Cable TV. Free RV / Bus / Truck Parking, Pets allowed (fee), 25 Inch Cable TV With 50 Channels, CNN, ESPN, Alarm Clock In All Rooms, Coffee Maker In All Rooms, Free Local Telephone Calls, Free Outdoor Parking, Hair Dryer In All Rooms, Ice Machine, In-Room Safe In All Rooms, Iron/Ironing Board, Laundry Service, Microwave In All Rooms, Refrigerator In All Rooms, Seasonal Outdoor Heated Pool & Spa, Wake Up Service. Railroad View: Good. You need to have a room on the front west side of the motel in order to have a good railroad view. Other rooms will only provide a fair to poor view. East side rooms will likely be blocked by trees. Trains run just across US-6, some trees & brush along the railroad take away from an excellent view at this motel. Comments: Motel not yet rated by RailfanMotels.com. Photo Comments: Knights Inn is located on the north side of the tracks along US-6.